Who wants to feel relaxed, rejuvenated and remarkable? Yes, every one of us deserves it. After a long day of the hustle and bustle of our daily living, we need to feel some sense of wellness and retreat in our own happy place. Who wouldn’t want an extra hand in making sure the household is clean? How about helping you or your children efficiently breathe when one is under the weather? 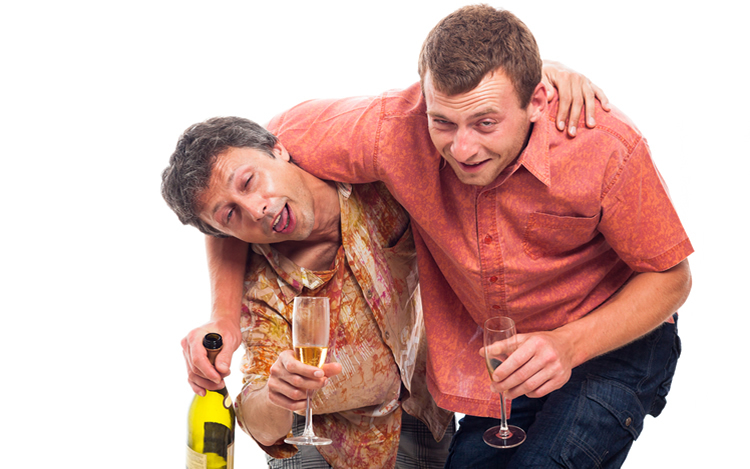 I think you can get some help from my friends… the essential oils! Essential oils have been used by ancient people centuries ago. It even dates back to the Biblical time when Jesus Christ was born and the wise men gave Him frankincense and myrrh as gifts. The ancient population of various continents (e.g. Asia, Europe) have valued essential oils for their many uses and purposes (e.g. health, beauty, and wellness). In the mid-19th century, Rene-Maurice Gattefosse suffered from burn and he treated it with lavender essential oil. He coined and studied the term “aromatherapy” and became the “father of aromatherapy” . Aromatherapy is “the inhalation or application (as by massage) of fragrant essential oils (as from flowers and fruits) for therapeutic purposes” . Essential oils have gone a long way. Today, there is growing interest in the use of and research about essential oils. They are used in complementary health approach (aromatherapy). Lots of companies now sell various essential oils to cater to different purposes. Essential oils (EO) are the “volatile” compounds that are found in the bark, stem, leaves, root, seeds, flowers and other parts of plants. In reference to essential oils, volatile means the compounds are able to speedily change its state from liquid to gas . That is why when you open a small bottle of essential oil, people in the room may easily notice its smell! EO’s are 50-70% more potent than their herbal counterparts. For example, one drop of high-quality peppermint EO is equal to 28 glasses of peppermint tea! EO’s are highly concentrated such that it takes around 50 pieces of lemons to produce 15-ml of lemon EO and a whopping 105 pounds of rose petals to produce 5-ml of superior quality rose EO! . It’s not as easy as 1-2-3! 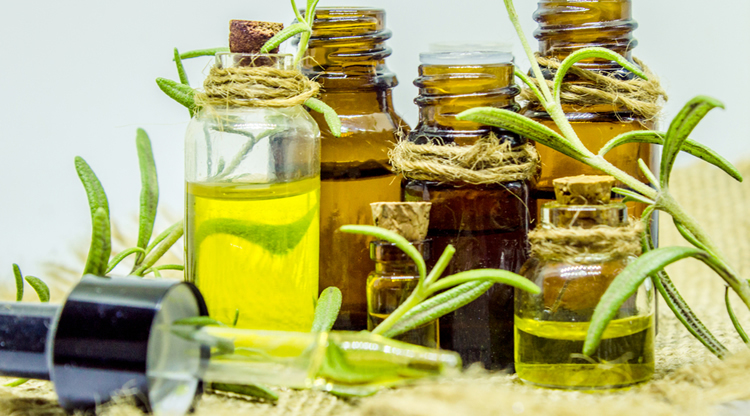 A variety of factors such as rainfall, sunlight, temperature, soil, nutrients and wind affect the quality of essential oils, not to mention the inherent elements like the plant’s growth and development. To ensure they are not damaged or changed from their original form, extreme care is practiced in harvesting the plants . It is the most commonly used process wherein steam purifies a liquid so it vaporizes then cool and condense the vapor into its liquid state. According to Oxford dictionary, it is “the partial removal of a substance from a solution or mixture by dissolving it in another, immiscible solvent in which it is more soluble”. It is used for more delicate plants/plant parts, e.g. jasmine petals. Extraction of oil without applying heat, e.g. for olive, coconut, almond, rosehip seed oils. It is the best method for heat-sensitive oils, e.g. lavender and citrus oils, wherein carbon dioxide is used as a solvent to extract essential oils. It is important that you examine the essential oils you want to buy. Make sure that the company is reputable, trusted and responsible. Some EO may have been adulterated to a huge extent so do check for quality EO. How do I get to use and enjoy essential oils? Through inhaling. Directly inhaling essential oils rapidly affects a person’s sense of smell and subsequently influences the central nervous system (brain and spine), especially the system of the brain which is particularly associated with motivation, emotion, behavior and smell. The small particles are then absorbed via the bloodstream. EO’s affect us at psycho-biological level, like when we smell an enjoyable scent we take slower and deeper breaths which in turn ease breathing as what happens in meditation . According to Dr. Snyder, there are three groups for aromatherapeutic oils: uplifting (e.g. citrus oils), calming/soothing (e.g. floral oils), balancing/grounding (e.g. vetiver, cinnamon oils). 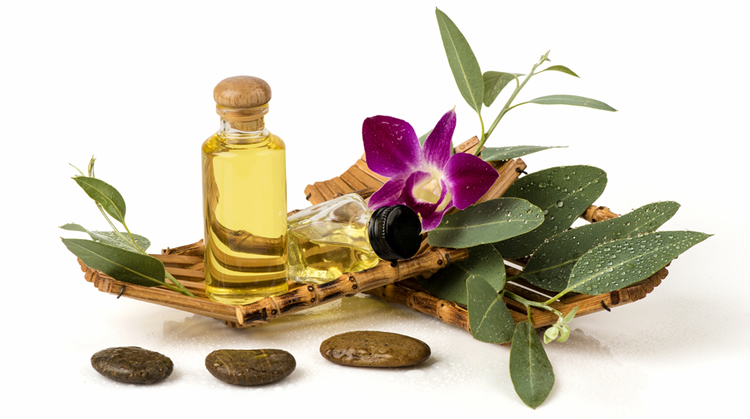 Adding essential oils to massage oil reinforces the benefits of massage treatment . How can I inhale EO’s? You can put one or two drops of the EO to your palm and deeply breathe the aroma (be careful not to touch your face and eyes). Is there indirect inhalation method? Yes. There are various ways to do this. One can simply drop an EO to a cotton ball, tissue or handkerchief and place it in strategic location in the house/room, car or inside bags, etc. Another mode is to drop EO in a diffuser. You can also mix EO’s with water in a glass spray bottle and mist on household furniture, linens, etc. Some place a drop of EO (e.g. lavender) on their bed sheet or pillow case to help attain a good sleep. There are a number of hospitals which now use essential oils in their ventilation system . Carrier oils are made from nuts, seeds or fatty vegetables. They are used to dilute essential oils, prevent them from vaporizing and allow better absorption of the EO on a greater surface area. Examples include jojoba oil (naturally resembles the oil of our skin and has long shelf life), coconut oil (can be raw or fractionated), sweet almond oil, grapeseed oil, avocado oil, etc. In terms of topical application, the term “neat” refers to directly applying oil from the bottle to the skin. This is not suggested for infants and young children. The term “diluted” refers to adding carrier oil to the essential oil to lessen the potency . This is through the use of essential oils in culinary aspect (cooking, baking), e.g. peppermint, cinnamon, lemon oils, etc. There are some which are added to drinks like milkshake, etc. 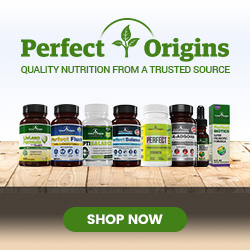 Certain companies recommend taking EO in a vegetable capsule. It is necessary to follow the instructions for some potent EO’s. Essential oils have gained popularity for the past years. I personally use it for myself and my family. I share it with interested friends and they find it beneficial as well. But, I believe that its effects may vary from one person to the other. 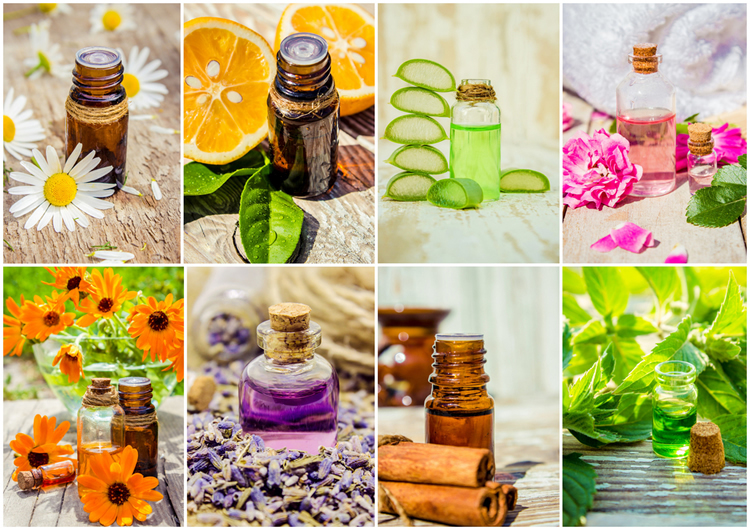 Essential oils are used in perfumes, food flavors, health & medicine and aromatherapy. For me, with all the essential oils present in the world, there could be a million uses and benefits that they can contribute to us! Some of its use include promotion of clear breathing and opens up airways, skin purifying and breath-freshening properties, helps reduce tension in the body, powerful aromatic cleanser when used with vinegar, water and other EO’s like lemon and peppermint. Ancient Egyptians and Romans used this in relaxing baths, cooking and perfumes. Helps to calm and soothe the mind and body; promotes balance; helps promote sleep. Used in beauty, personal care and cleaning products for its valued cleansing and purifying attribute. It has been used by native Aborigines in Australia to heal cuts, wounds and skin irritation. It has germ-fighting properties. It promotes health immune function and is also used to purify and freshen the air plus it is used as a hard surface cleaner. A potent essential oil that supports the immune and respiratory systems. It is also used in cleaning agents. Extra care should be taken as it is considered to be “hot” oil and can cause burns. It must be properly diluted with carrier oil. When applied topically, it helps to cool down the body. Helps to calm and soothe aching muscles, alleviate occasional stomach aches due to bloating, and helps to bring back your focus. It can also repel rodents and insects! It is widely used in toothpastes, mouthwash and chewing gums although synthetic peppermint is used in these products. Used by ancient Romans to give them audacity and clear minds during war. It is considered as one of the safest and most calming essential oils. It helps to support sleep and helps to calm active kids. It is used in beauty products and massage oils. It is known as the “king of essential oils”. Prized since biblical times for its deep, spicy earth notes and incense overtone. It supports healthy cells and immunity, also supports respiratory health when combined with other essential oils. It rejuvenates skin and has infinite usage for emotional and spiritual balance. It is used in Asian dishes while promoting digestive health. It heightens awareness and helps soothe the body when used for massage. It has purifying and toning properties and it is widely used in beauty care products. Its aroma is also valued in cleaning products. It stimulates the body and mind and supports a healthy immune system. 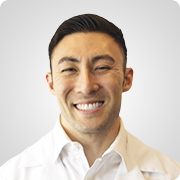 It is appreciated for the ability to support the digestive system. It can also be used in recipes which need a boost of citrus flavour. It is considered to be sacred in many ancient civilizations. It was used for protection from the pandemic and for cleansing evil spirits. Nowadays it has many uses e.g. culinary use, hair care, reduction of nervousness and anxiety, stimulation of mind and memory, maintain concentration. Word of caution: do not use if you are pregnant, workaholic/hyperactive or has hypertension or being treated for epilepsy. Avoid heat and sunlight. Best places to store them are cabinets (e.g. in the bathroom). Keep the bottles tightly covered to prevent oxidation and evaporation. Use only glass or stainless steel containers for EO’s. When trying a new essential oil, always check with specific safety data. Before taking EO internally, please consult with a professional or qualified practitioner. Phototoxic oils can cause adverse reaction when used before exposure to sunlight or UV light. Examples are angelica, anise, bergamot, bitter orange, coriander, cumin, ginger, grapefruit, lemon, lime, orange, tangerine, etc. There are oils which irritate the skin especially in high concentrations. There are the so-called “hot” EO’s due to their warming and burning effect, e.g. oregano, clove, cinnamon & cassia oils, etc. There are also “cooling” oils for their cooling effects on the body, e.g. peppermint, eucalyptus, lemongrass & wintergreen oils. Do not use more than 3 drops of these oils in a bath. Patch test is done before trying any new oil on the skin. You can place one of few drops of the new EO on the back of your wrist, cover it with plaster and check after one hour. If the skin gets irritated or red, decrease the suggested concentration of the EO or avoid applying it again. First, keep the EO bottles out of the reach of infants and children. It is suggested that you increase the dilution to at least half of the advised amount. For infants 0-12 months old, use only 1 drop of EO (e.g. lavender, chamomile or rose oil) in 5 ml (1 tsp) of carrier oil for massage or bathing. It is recommended that during and around pregnancy, just use half of the suggested amount of EO. Some of the EO’s to avoid are angelica, aniseed, basil, pepper, camphor, chamomile, cinnamon, clove, fir, myrrh, oregano, rosemary, thyme, wintergreen, etc. Passed the Generally Recognized as Safe (GRAS) standard which means it can be used in food flavoring. But, this does not mean that you can directly ingest them through your mouth! Essential oils are not strictly regulated, even so some classify them as “food grade”, “perfume grade”, “therapeutic grade” “certified organic”. Be watchful and do your own research. The scientific name of the plant source is written on the label. Blended EO should list the names of all the plant sources along with their scientific names. If you are buying diluted oil, the name of carrier oil (e.g. coconut oil) should also be indicated. EO should be packaged in amber or dark glass bottles with orifice reducers. There should not be “one price fits all” for essential oils! A variety in quality, source, extraction/production mechanism, etc. makes the difference in prices of EO. 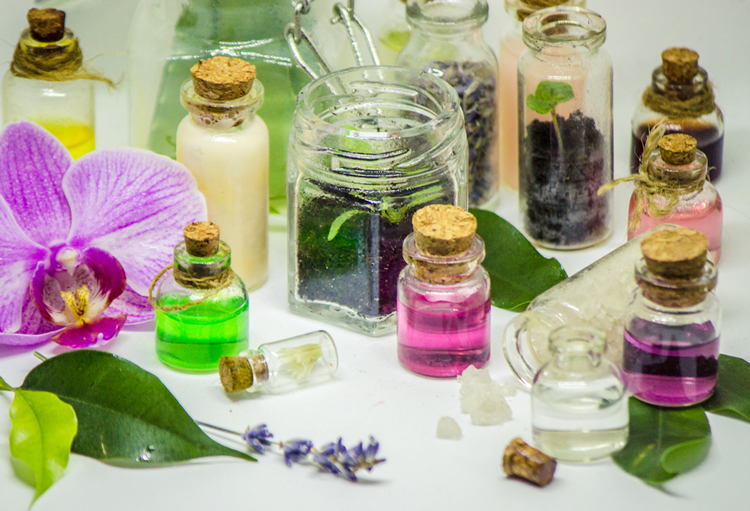 According to University of Maryland Medical Center , aromatherapy is now widely used in a variety of settings (from health spas to hospitals) to give remedy to a range of conditions. Generally, it appears to help in pain relief, mood enhancement, and kindle relaxation. Numerous essential oils, including lavender, orange, bergamot, rose, lemon, sandalwood, etc.) have been revealed to relieve fretfulness, tension, and sadness. Some clinical studies suggest that when essential oils (specifically frankincense, rose and lavender) were used by qualified midwives for pregnant women during delivery, the patients felt less fear and anxiety, had a robust sense of wellbeing, and had less need for pain relief drugs during delivery. Several women also recounted that peppermint oil alleviates nausea and vomiting during labor. Note: Always do patch test before trying any essential oil. If you have any health condition, consult your healthcare provider before trying any essential oil. Remove caps from oil bottles. Pour 2 teaspoons sweet almond oil into your palm of your hand or in a small non-plastic container. Add 3 drops each of geranium, lavender, Roman chamomile, and sandalwood essential oils. Massage feet with the Sleepy Time Foot Massage Blend. Concentrate on big toes and the arches of the feet. In a glass bowl, combine 1 tablespoon liquid coconut oil, 5 drops peppermint, and 4 drops lime essential oil. Stir oils together with a metal or wooden spoon. Add ¼ cup Epsom salts to the oil mixture and stir until oils are evenly distributed throughout the Epsom salts. Begin with your feet either over a towel by a sink or in the shower. Use your hand to scoop approximately a quarter of the scrub from the bowl. Massage the scrub into one of your wet/damp feet (your feet should still be at least damp from the Soothing Foot Soak). Scoop another quarter of the scrub into your hand and massage your other foot. Use the remaining scrub to exfoliate any particularly rough areas of your feet, such as your heels. Rinse your feet in the sink or shower with warm water. Pat your feet dry with a towel and allow them to fully air dry before putting on shoes or socks. Peppermint essential oil is stimulating to the mind and helps ease muscle pain. It inhibits the growth of fungus that may affect the feet. Lime essential oil is cleansing oil with mood-enhancing properties. Epsom salt is well known as a treatment for muscle aches and pains, it also serves as exfoliator due to the crystal salts. Coconut oil (also with inflammatory & anti-fungal properties) moisturizes and soothes sore feet. Add all ingredients to a glass spray bottle and shake well. Spray on mold or scum in the tub shower or any place in the bathroom. Do not rinse. Repeat weekly or as necessary. Both tea tree and eucalyptus essential oils are powerful cleansing agents. They both have good antifungal, antibacterial and antimicrobial properties. Truly, essential oils have many benefits to offer. More scientific studies on essential oils are conducted around the world (Europe, Australia, Japan, India, the United States, and Canada). Many of these researches describe the remarkable healing properties of various essential oils . Atkinson, Alicia. (2015). Essential Oils Beauty, Wellness, and the Home. United States of America: Skyhorse Publishing.